Morning breaks at Ghangaria pretty early. By 4:30 you hear chants of sikh pilgrims on their way to Hemkund. I opened the door of our room and looked outside.. the view was breath taking. From our first floor veranda it was a majestic sight.. the Garhwal range of Himalayas right in front, surrounded on all sides by pine forests and shrouded in a thin veil of mist. While we sat there sipping on a hot cup of coffee, the mist slowly gave way to the first light of the day. The mountain top puts on a bright orange hue as the sunlight falls on it, which slowly creeps down till the entire mountain range is lighted up. The snow on the slopes and crevices reflects the light accentuating the beauty of the peaks. You will not realize the passage of time when you sit there drowned in the beauty, staring in awe at such imposing creations of nature. Beauty can have strange effects on people. After seeing the mountains, myself and Rob decided to have a haircut, we wanted to get rid of all the ugly hair on our head. So we walked along the streets in search of a barber. The first one we found was still fast asleep. He said that he is planning to sleep for a while more and directed us to another shop near the Gurudwara. Finally we located the barber shop, woke up the barber and told him our plan. He could not believe that we wanted to go bald... he was only used to requests for trimming the beard. With much laughter and disbelief, he started his job and soon his entire family joined us at the shop to see the two crazy guys who wanted to go 'ganja'!! We even managed to attract the attention of a few passing by - mostly old Sikh pilgrims who were visibly alarmed. The bath after the haircut was equally interesting. The water was freezing cold and its effect on the bald head was painful. I had to massage my head vigorously after pouring two cups of water, to get back to senses. For the three days we were in Gangharia, bathroom singing was not just a hobby, but a necessity to avoid getting frozen in bath. Soon after a breakfast of aaloo parathas, with more more aaloo parathas packed up for lunch, we started our trek to the Valley of Flowers by 8. From Gangharia, the route to the valley and Hemkund separates after crossing the Laxman Ganga river on a tin sheet bridge - the one to the left goes to the valley and the one to the right to Hemkund. There is a forest office at the beginning of the VoF trek route from where you have to get entry passes. Though you start seeing a lot of flowers from this point, the actual entrance of the valley is four kilometers from there, where you find a map showing the trek route and the various peaks in the valley. One common mistake people make is that they walk till the entrance, expecting flower beds all around, like the ones they see in botanical gardens or in the movies. Some even walk another kilometer or so from the entrance and come back saying they did not see any flowers. We did find a few who returned too soon saying that there was nothing like what they expected. The fact is that you have to walk at least 3 kilometers from the entrance to see the actual beauty of the valley. So most of the people end up missing the breath taking views at the end of the valley. Also it has become a practice for us in daily life to ignore the small details and always look forward to something BIG and astounding all the time. 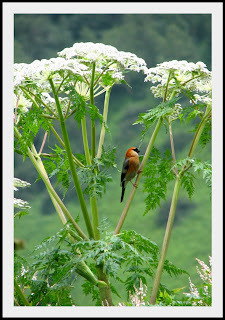 There are in fact lot of beautiful flowers all around the valley.. in the first one kilometer walk itself, we could identify at least 25 - 30 different kinds of flowers. Our plan was to go till the very end. After taking tickets, you pass some pine woods and climb down to reach a bridge across river Pushpavathi. The rocks by this bridge is the sole location of the beautiful Himalayan Blue Poppy flower in the valley, often called the 'Queen of Himalayas'. 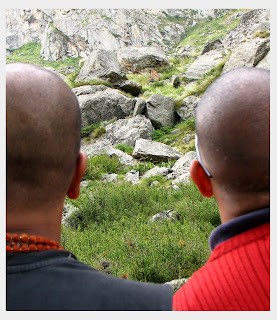 We didn't find any there, but saw many the next day on the way to Hemkund. There are numerous streams flowing across the valley and the ones towards the end had crystal clear water. 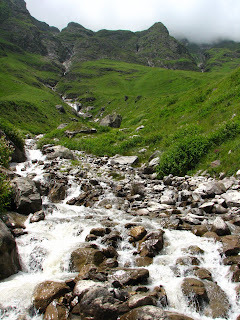 The trek route follows the river till the entrance to the park, where we have to cross it. There are flowers of all colors in the valley - from white to yellow to pink to blue to purple to maroon to dark red... you only need to look around to see them. 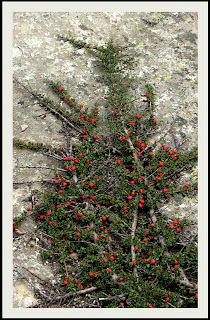 There are even brightly colored berries on bushes or creepers all over the rocks. Even the lichens and moss are not your usual dull black and whites. The valley puts on a different color every month depending on the prominent blooming species of that time. Purples and whites were prominent during early August when we visited.. with occasional patches of all the other colors. After walking about four kilometers you reach the entrance of the valley, to catch the first glimpse of its beauty. The valley is bordered by green carpeted mountain ranges of Nilgiri and Rataban on the left and right. To the North, blocking the view is the Byunder Khal peak with its snow clad peaks and ice glaciers. There are a few glaciers inside the valley as well, but this time of the year, the snow had all melted off and the landscape had been reclaimed by Himalayan balsams, Asters, Edelweiss and many other flowering plants. Though we could not play around in the snow, the flowers compensated more than enough for the loss !! The irregular eating habits of the previous two days had left Subbu a little weak. The high altitudes and strenuous trek added to the misery and he was forced to take some rest by a big rock while the rest of us walked on. Rob and myself tried to cajole Subbu with our 'beautiful' songs from the 'Sound of Music', but they almost had an adverse effect on his health. I know it was the weather and not the music... we had even modified the lyrics to "how do you solve a problem like Subbu.." and sang it in all possible keys, together!! We had our lunch by the side of another beautiful stream before continuing our walk. Kudos to the forest department, the whole valley is well maintained without a piece of paper or plastic visible anywhere. Perhaps the fact that they are just allowing nature to manage it her own way is the reason for the beauty. The stone paved walkways are a treat to see amongst all the bushes and flowers. We came across the grave of Miss Margarate Legge, a botanist who lost her life while documenting the flaura and fauna of this beautiful valley, but did not take the detour to get close to it. A few kilometers after the valley's entrance the flower density increases considerably as if leading us to some grand finale... and boy, what a sight it was. The end of the valley presents a picture of paradise... the pushpavathi river valley full of purple flowers, with the rivulets criss-crossing the flower patches and the mountains standing guard all around it. I am truly incapable of putting in words all the beauty and grace we saw there. We calmly sat down by a rock and started singing songs, staring at the beautiful valley ahead. I had my harmonica with me and I couldn't help playing a few tunes as well. It takes a while for the feeling to sink in.. that we are finally in the valley of flowers, the place we all dreamed of for quite some time. It is the closest I have ever come to the concept of so called heaven. This is where I'll stay.. Returning from such a place of joy is always a difficult decision to make. But we might start overlooking the beauty of even such a place, if it ever become a part of our daily life. So after spending close to an hour there, we started our walk back to Gangharia.. turning around and taking another look at the beautiful scenes every now and then. The valley looked more colorful on the return trip. Suddenly it looked like there were far more flowers than what we saw on our way up. Don't know whether it was for real or the effect of the beauty we saw around. Looks like the flowers all come to life once the harsh afternoon sun give way to twilight. We were back in Gangharia by 7. We had an overdose of excitement which was quite intoxicating and the surrender to sleep was full and voluntary. I stumbled on your blog through the 'next blog' feature. Love the photos. Looks absolutely stunning! Going alone should not be a problem. I somehow feel it's great if you have someone to share the joy and beauty :). Let me know if I can help with any more info. Enjoy your trip..!! thanks for your suggestion. actually I am going to find out the perfect way to enjoy that place, so next time I will go with my wife. 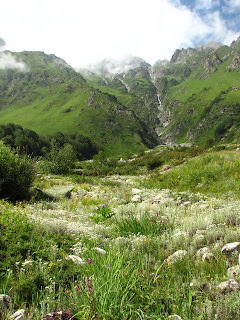 Have you seen the movie Valley of Flowers? I think you might enjoy it. It's a love story and the woman (Mylene Jampanoi) is absolutely stunning, I think. Hopefully the files are still there. 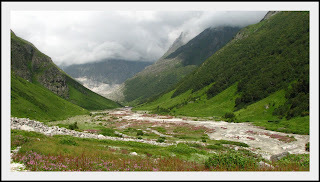 Valley of Flowers is near the top of my places to visit list. I'm afraid that once I make my way there I won't want to leave. In the meantime, please continue to post your adventures. Thanks!!! Thanks for the movie link, I will try to get a copy of the movie. And do let me know if I can be of any help, when you plan your trip to the valley of flowers. Leading Travels Company in Haridwar Uttarakhand. 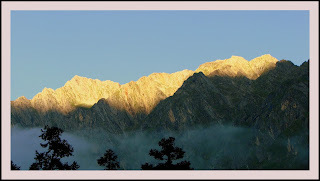 We organige Valley of Flower tour in Uttrakhand.